With four weeks of the season in the books outside of Monday Night Football, it’s time to check in on another of the PFF Elite stats, and this time we focus our attention on coverage. 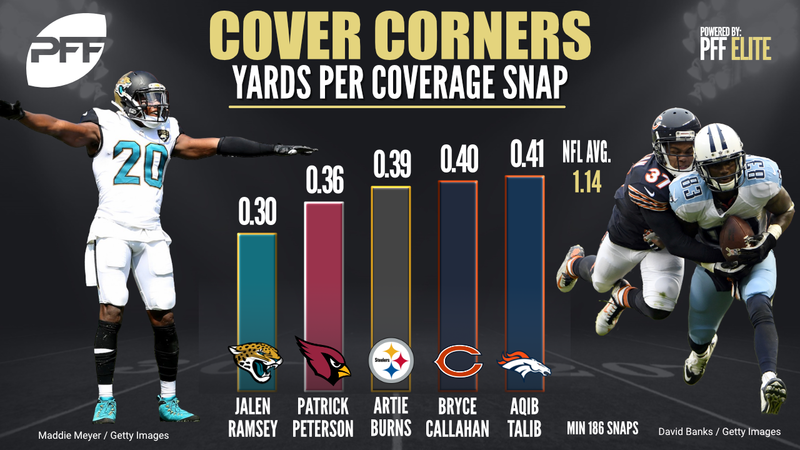 We are going to look at some of PFF’s cornerback sig stats, first diving into the top coverage numbers of the 2017 season, and then taking a look at which corners have been most active in the run game. The man with the hardest assignment in the game, Patrick Peterson has once again been as difficult as it gets to complete a pass on, allowing just 41.7 percent of passes thrown his way to be caught, and seeing fewer than half the total targets of the other top Arizona cornerbacks. 2016 was a huge departure from the career baseline of Morris Claiborne, and so far 2017 has been somewhere between those polar extremes. He has allowed 54.5 percent of passes thrown his way to be caught, but he has seen just 11 targets on 264 snaps of action. So far this season Jonathan Joseph has allowed just eight yards after the catch, and a total of 76 receiving yards into his coverage, though one of those receptions did go for a touchdown. He has been targeted nine times, allowing four catches, and has a pair of pass breakups. Baltimore’s Jimmy Smith is approaching something like his best form again in 2017. Smith has allowed just six catches through four weeks of the season, despite being targeted 15 times, and the passer rating he has surrendered on those targets is just 26.0, the third-best mark in the league. 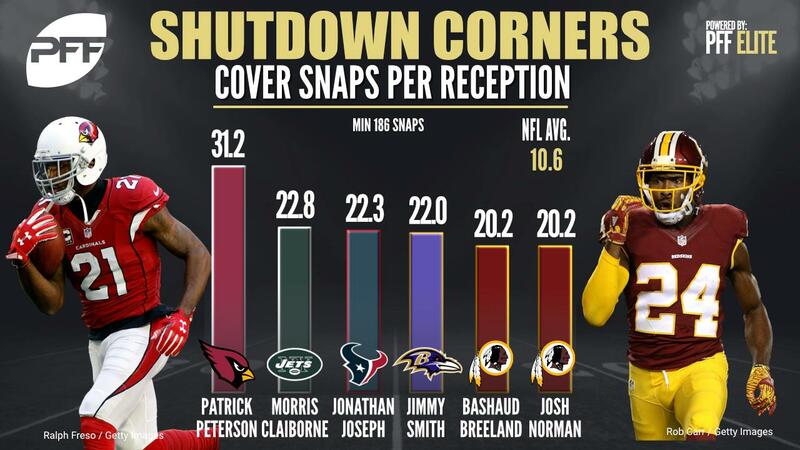 Bashaud Breeland has been the least-targeted of the three top Washington cornerbacks, seeing only nine passes thrown his way despite playing an identical number of snaps to Josh Norman on the other side. H has surrendered five receptions for 49 yards on those passes (55.6 percent), and given up a passer rating of 71.1. Like Breeland, Norman has played 163 snaps, and given up five receptions, but Norman has seen the ball come his way an extra four times, so has allowed a completion rate of just 38.5, the second-best mark in the league. Those passes have produced a passer rating of only 55.9. Jacksonville’s second-year corner Jalen Ramsey stands on the precipice of greatness. This season he has allowed just seven catches through four weeks, and they have gone for a total of 42 yards, with no single catch going more than 10 yards. He has allowed a passer rating of 23.4, and a completion rate of 36.8, the best mark in the league. Not only is Peterson tough to complete a pass on, but when he does give one up, they are not big plays. He has allowed 56 total yards receiving this season, and just three of those yards have come after the catch. He hasn’t allowed a reception longer than 18 yards. Artie Burns has began the 2017 season well, and despite being relatively heavily targeted (21 through four games), he has allowed only 11 receptions for 61 yards. Though one of those catches went for a touchdown, he has broken up two of the incompletions, and those 11 receptions have averaged 5.5 yards per catch. Bryce Callahan has played 169 snaps, the third-most among Chicago cornerbacks, and seen the third-most targets as a result, but he has done dramatically better than the other two in terms of how much damage his receptions have done, averaging just 5.9 yards per catch compared to 14.4 for Marcus Cooper and 12.2 for Kyle Fuller. Whether Aqib Talib could keep up his elite play from 2016 was something to watch heading into this year, and so far that answer is a resounding yes. He has allowed ten receptions on 17 targets, but they have gone for a total of 66 yards, with nothing longer than 14. 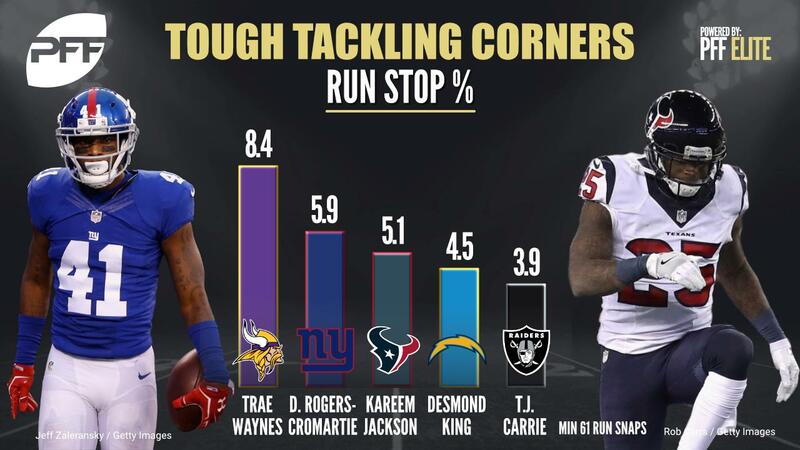 Trae Waynes has been something of a let down as a first round pick, and in coverage he has had his struggles, but he has at least been an active participant in the run game, leading the league with seven defensive stops in the run game, two more than any other cornerback. Dominique Rodgers-Cromartie isn’t known for his run defense, but so far this season only Trae Waynes has more defensive stops in the run game than his five. Unlike Waynes though, he has missed four tackles to go along with his successful stops. Houston’s Kareem Jackson has struggled in coverage, but has been an active player against the run, notching four stops without a missed tackle on his slate. Desmond King has seen less playing time than the other players on this list for the Chargers, but has still notched three defensive stops, which is one of the best rates in the game. He has missed two tackles in the process too, so his strike rate could be even better. Oakland’s T.J. Carrie is another player to notch his run stops without missing any of his attempts. He has four stops, and has been in on ten combined tackles in the run game.